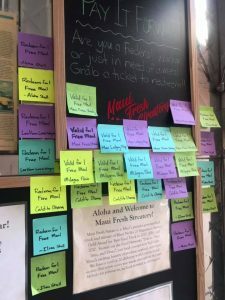 Maui Fresh Streatery owner Kyle Kawakami has begun a “Pay It Forward” campaign to help provide free meals for federal employees and Coast Guard members who are currently not getting paid. 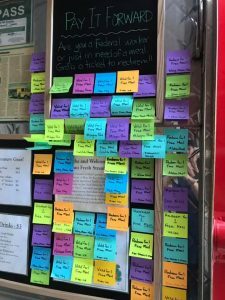 The idea began on January 11 via social media, with the food truck owner posting his concerns about local families affected by the partial government shutdown. 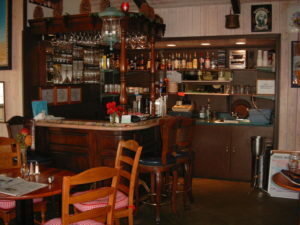 Since then, the campaign has received an outpouring of support from residents and businesses. Maui Fresh Streatery even delivered meals to 50 workers at a time, including air traffic controllers, USDA inspectors, customs, wildlife other federal employees. You can see the progression of the outreach in this photo slideshow. 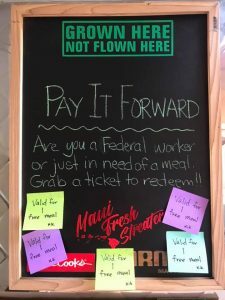 January 11: Maui Fresh Streatery launches its Pay It Forward board with five free meals for federal employees during the partial government shutdown. Courtesy photo. Within the first hour of business on January 11, the Pay It Forward board captures attention. Courtesy photo. 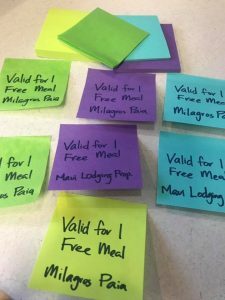 A few hours later on January 11, free meal tickets on the board at Maui Fresh Streatery has grown from five to 30. Courtesy photo. 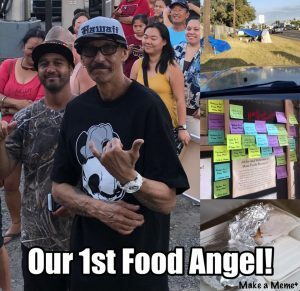 A “food angel” delivers two hot meals from Maui Fresh Streatery to strangers in need of food on January 11. Courtesy photo. 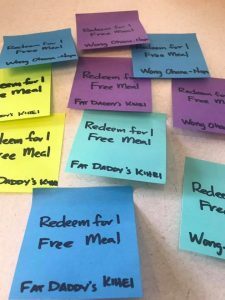 January 12: More contributors to the Pay It Forward board at Maui Fresh Streatery food truck. Courtesy photo. 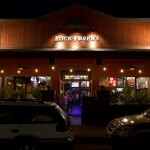 January 13: The support continues to pour in at Maui Fresh Streatery. Courtesy photo. January 14: 30 meals heading out to Federal workers at Air Traffic Control, USDA, Customs, and Federal Wildlife at the airport, provided from the Maui Fresh Streatery’s Pay It Forward effort. Courtesy photo. 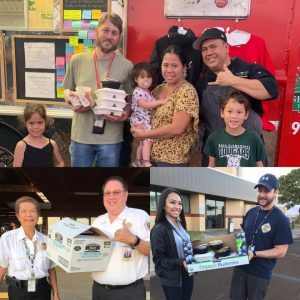 January 14: Maui Fresh Streatery’s Kyle Kawakami says, “Through all of your support and donations we fed almost 50 workers tonight.” Courtesy photo. 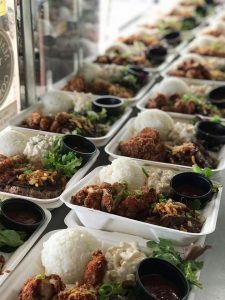 Known as “Big Red,” the food truck features locally-sourced ingredients and makes appearances throughout Central Maui, typically on Mondays in Maui Lani (either 11 a.m. to 1 p.m. or 5 to 7 p.m.), Wednesdays on Vineyard and Church Streets in Wailuku (11 a.m. to 1 p.m.) and Friday evenings at Ilima Shell station or Ultimate Air Maui ( 5 to 7 p.m.). 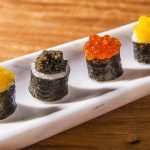 Follow the business on social media for details, and learn more about the food truck and its rotating menu of different cultural cuisine in our previous video, Maui Fresh Streatery: Gourmet Grab & Go. Kawakami tells me the Pay It Forward campaign will keep going as long as it can sustain itself, and he is humbled by both the islandwide support and the gratitude of those receiving the meals.